Saxophonist Vincent Herring is back with his third release for Smoke Sessions Records, a musical tonic to help calm the turbulence of modern life entitled, Hard Times. The set contains eleven songs, featuring a core quartet of pianist Cyrus Chestnut, bassist Yasushi Nakamura, and drummer Carl Allen. Herring’s concept of the project evolved along with the tumultuous year, as he was joined by Nakamura and Allen for two sets every Monday at Smoke for six months. Hard Times features a stellar cast of guest artists on roughly half the tracks with: trumpeter Brad Mason, saxophonist Sam Dillon, and trombonist Steve Turre. Guitarist Russell Malone plays over three tracks, while the rich baritone sounds of vocalist Nicolas Bearde also graces three tunes. The John Handy classic, “Hard Work,” opens the album. The arrangement finds Herring surrounded by a fine horn arrangement that puts his saxophone front and center. A great album opener, and the group instantly established a hard-swinging atmosphere that both Herring, Malone and Chestnut dig in on and turn into wonderful solos. The simple harmony allows each player to twist and turn in and out of the main harmonic color to paint with beautiful substitutions and colorful extensions. A very hip arrangement of Bill Withers’ “Use Me” is next with Bearde taking the lead with his full raspy voice that captures the allure of the original melody while adding all the right ornamentations to make you know you’re listening to jazz. The funky feel allows Herring to give his solo some contemporary flavors, that build to upper register squeals. Malone dirties up his sound and bends his strings to get just the right vibe on this grooving selection. The album takes its title from David “Fathead” Newman’s “Hard Times,” which perfectly embodies Herring’s theme of finding things to celebrate in the face of daunting obstacles. Again, the horn arrangement is full of colors and hip hits and twists. Herring is in full classic mode on this one, melodic notes fly out of his horn in effortless streams of blues drenched bop infused emotional statements. Never overplaying, but always saying things thoughtfully and with clarity – Herring’s main musical statement. If this tune does not bring a swinging smile to your face, you’re simply dead! Some of the most enjoyable saxophonists of our time create a strong sense of musicality and finesse within their playing styles. Herring reminds me of Henderson in the way that the melody and caressing the notes with a fluidity is a key point. An enjoyable set, from an enjoyable group. Simply stated, with a high value of enjoyment. It’s a win. 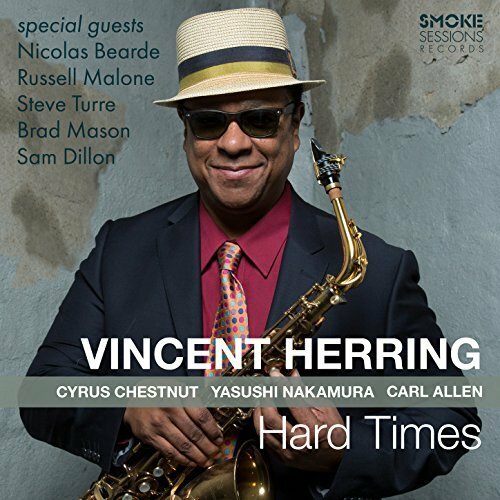 Be the first to comment on "Vincent Herring | Hard Times"